Working to support and advocate for Detroit’s LGBT community in transforming lives and increasing their possibilities affords LGBT Detroit to stand as a symbol of hope. LGBT Detroit recognizes the various symbols used to represent intersections. The Rainbow Flag is a universal symbol that recognizes the LGBT movement and the Kwanzaa symbol for “Ujamaa,” (oo-JAH-ma) Cooperative Economics, is our corporate icon. It’s one of seven principles that encourages us to build and maintain our own stores, shops, and other businesses — and to profit from them together. For over two decades, LGBT Detroit has been receiving unwavering support from neighboring communities in any capacity that promotes the wellbeing and integrity involved in fostering an environment conducive to lesbian, gay, bi and transgender individuals irrespective of race, culture or socio-economic status. The community support is manifested in their advocating, partnership, testifying before local and state legislators, providing safe gathering spaces where members of the LGBT community can interact without fear of persecution or bigotry. The Mission of LGBT Detroit is indelibly expressed as it demonstrates an increased awareness of the intricacies of the LGBT culture through education, cohesion and advocacy that affords one to identify, accept and honor their truths, sense of self and foster humanness. There are many supporters of LGBT Detroit who were actively involved in serving Southeast Michigan since 1994 and during the inception of KICK Publishing Company. Kick Publishing Company boasts being the third Black American LGBT media company created in the country. The company proved to be a vital source of information, awareness, and an organizing tool at a critical time whit the crisis of the HIV/AIDS pandemic and its impact on the gay and lesbian community. Kick Magazine by virtue of gaining national distribution placed Detroit’s LGBT community on the international map and gave credence to the vision and the goals of the company. “Hotter than July” which was the world’s second oldest “Black Pride” celebration. Its inception was in 1995, and it has since evolved into a social justice rally that captured and articulated culture, spirituality, and education in its programming. KICK – The Agency for LGBT African Americans emerged as a Michigan Non-Profit Organization, and was housed in a small secured a rental facility and its purpose was to provide programs and provide safe space for members of the LGBT community. In 2015, KICK became LGBT Detroit, and after doing much introspection it was decide that in order to facilitate growth and change we have to be able to create the change and lead the city of Detroit into an environment of hope and challenge the status quo on the miseducation and misconception of the LGBT community, and becoming a force or strength and unity. When we first got the property in 2016...It has changed a lot. 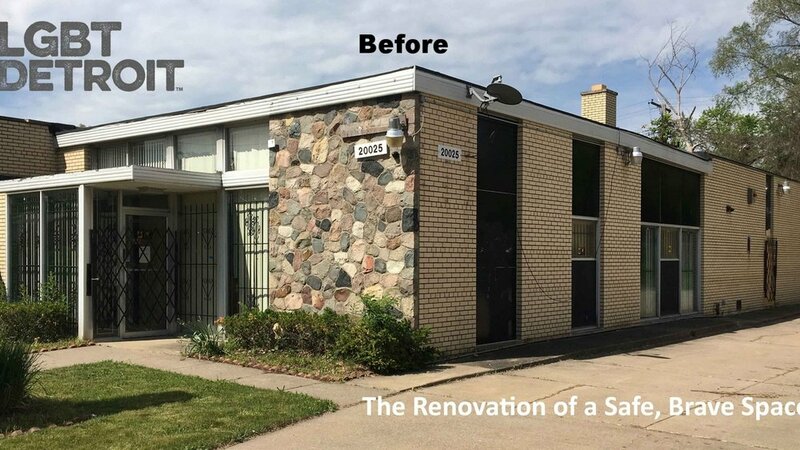 In 2016, LGBT Detroit acquired #SafeBraveSpace in Detroit’s northwest business and residential neighborhood, Murray Hill. Today, with local, regional, statewide, national partnerships and affiliations LGBT Detroit continues to work towards making Detroit a safer place for all to work, play and live, without fear and malice. Our growth has expanded to offering 15 programs, which entails events and activities that serves approximately 800 community members annually. Additionally, “Hotter Than July” hosts a gathering of nearly 20,000 people in Detroit each summer, and attendees are from all over the world.